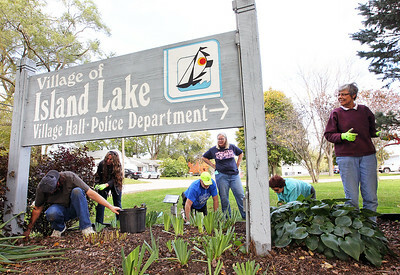 Candace H. Johnson-For Shaw Media Mark and Chrisine Beeson, John Burke, Sandy Doehler, Georgine Cooper and Mary Schuman, all of Island Lake plant iris rhizomes next to the Village of Island Lake Village Hall and Police Department sign for the Irises of Island Lake project in Island Lake. 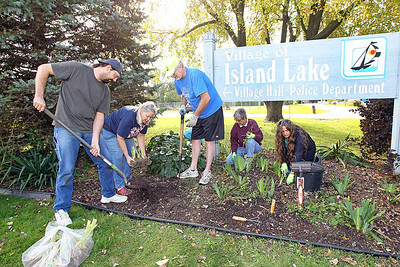 Candace H. Johnson-For Shaw Media Mark Beeson, Sandy Doehler, John Burke, trustees, Mary Schuman, and Christine Beeson (wife of Mark) plant iris rhizomes close to the Village of Island Lake Village Hall and Police Department sign on Greenleaf Avenue for the Irises of Island Lake project in Island Lake. 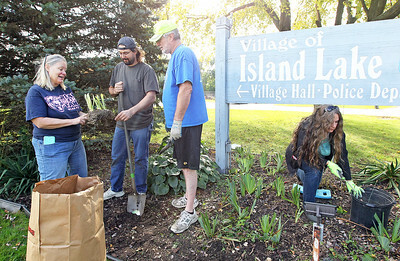 Candace H. Johnson-For Shaw Media Sandy Doehler, Mark Beeson, John Burke, and Mark's wife, Christine, all of Island Lake plant iris rhizomes next to the Village of Island Lake's Village Hall and Police Department sign on Greenleaf Avenue for the Irises of Island Lake project in Island Lake. Sandy Doehler, Mark Beeson and John Burke are trustees for the Village of Island Lake. 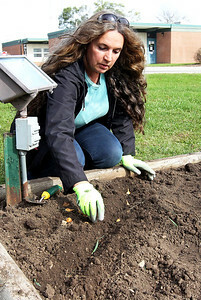 Candace H. Johnson-For Shaw Media Christine Beeson, of Island Lake plants Dutch iris bulbs in a row in the dirt next to the flagpole outside of the Village Hall for the Irises of Island Lake project in Island Lake. Beeson's husband, Mark is a trustee for the Village of Island Lake. 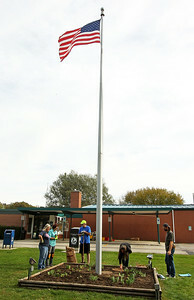 Candace H. Johnson-For Shaw Media Sandy Doehler, Georgine Cooper, John Burke, Christine and Mark Beeson, all of Island Lake work on planting iris rhizomes and bulbs next to the flagpole outside of the Village Hall for the Irises of Island Lake village beautification project in Island Lake. 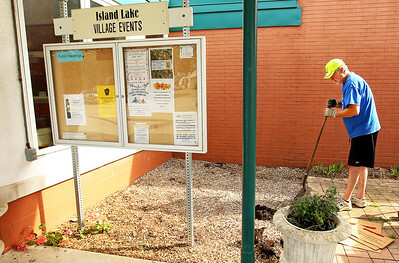 Candace H. Johnson-For Shaw Media Mary Schuman and Georgine Cooper, both of Island Lake work on putting iris rhizomes in the dirt next to the flagpole near the Village Hall for the Irises of Island Lake project in Island Lake. Candace H. Johnson-For Shaw Media Trustee John Burke digs some holes to plant iris bulbs next to the Village Hall for the Irises of Island Lake project in Island Lake. Candace H. Johnson-For Shaw Media Iris rhizomes sit in a box waiting to be planted for the Irises of Island Lake project next to the Village Hall in Island Lake. 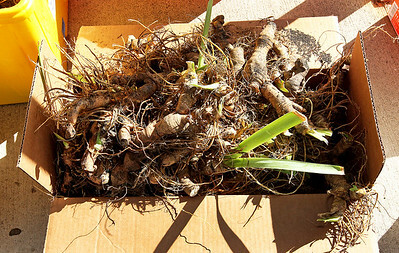 The donation of rhizomes came from Chicago. 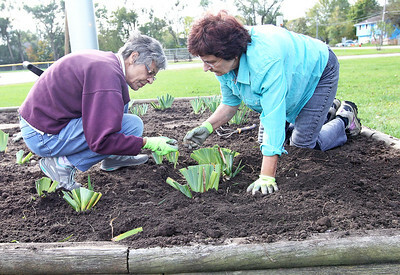 This is the second year of iris planting for this village beautification project. 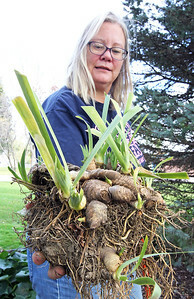 Candace H. Johnson-For Shaw Media Sandy Doehler, trustee, holds a bunch of iris rhizomes before planting them outside of the Village Hall for the Irises of Island Lake project in Island Lake. 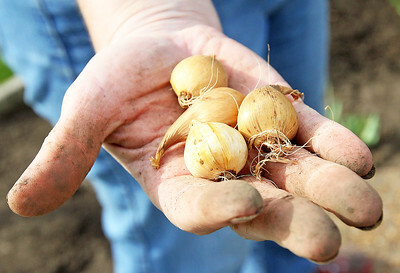 Candace H. Johnson-For Shaw Media Sandy Doehler, trustee, holds Dutch iris bulbs ready to be planted for the Irises of Island Lake project next to the Village Hall in Island Lake. Mary Schuman and Georgine Cooper, both of Island Lake work on putting iris rhizomes in the dirt next to the flagpole near the Village Hall for the Irises of Island Lake project in Island Lake.